Seems like I've managed to get a little time free recently to play with the odd puzzle or two, and one I've been playing with on and off for quite some time is the latest puzzle box from Eric Fuller, in the form of the Havanas #3. Not only have I had time to play with a few of the puzzles in my backlog, but I even seem to have time to write about them! When Eric first offered these back in November of 2013, I had the choice of all three woods he'd made the puzzle in. From the choice of Birdseye Maple, Pink Ebony and Flame Maple, I opted for the Flame Maple. No matter how hard I've tried, none of the photographs in this review do the puzzle justice. The Woods are simply stunning, and need to be handled to be appreciated. Sadly it seems there was a small error when Eric was making these, and he only had enough boxes to meet the pre-order quota of 50 boxes. 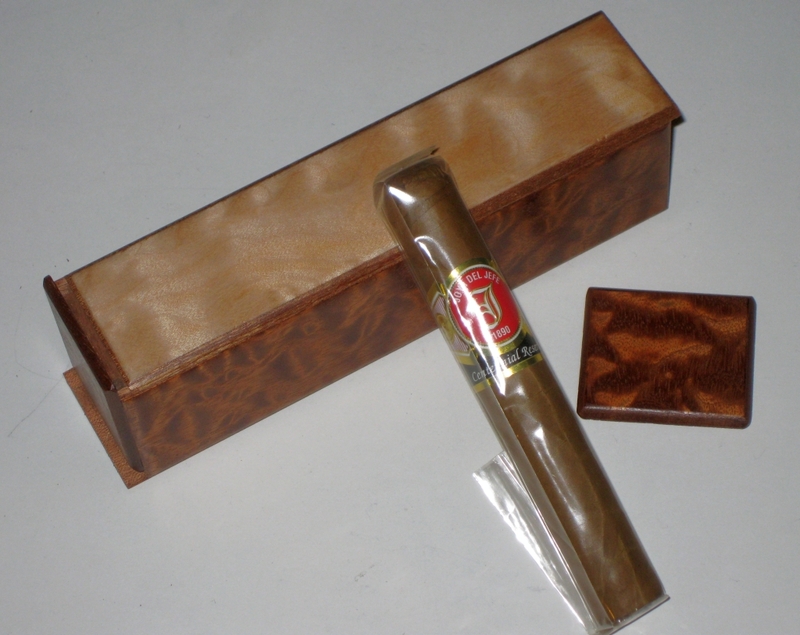 Measuring 1.7" x 1.9" x 6.4", this is the largest of the three Cigar boxes Eric has made so far, and given the trend, I'm not sure how large the next one is going to be. Strangely, despite this trend, the cigars inside the box haven't increased in size. 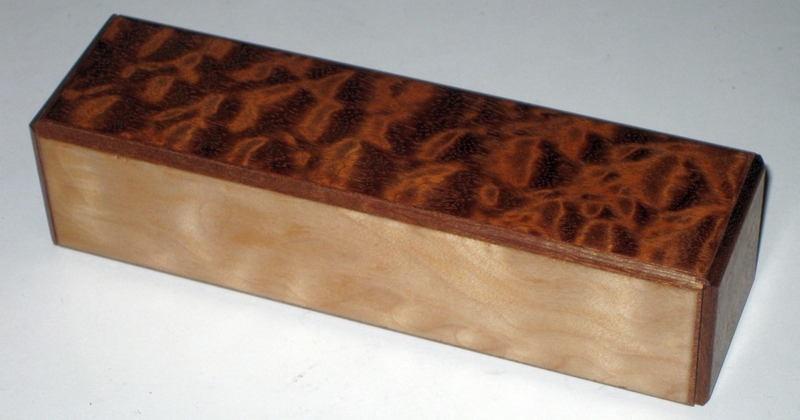 The box is made from quartersawn Sapele, which is remarkably stable, and allows Eric to make the box from fairly thin stock without worrying about the wood warping. 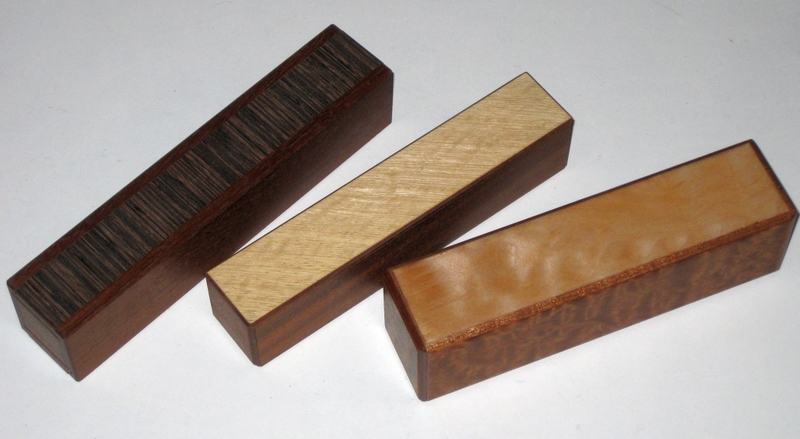 Each box then has the fancy woods applied as thin veneer to each face. The Quilted Sapele on the sides has a fantastic appearance, and to my mind is complimented well with the Flame Maple on the top and bottom. A few other puzzlers have already written about this puzzle, so have a look at the thoughts from Allard and Jerry. I'm a little slower in writing about it, not because I've not been lazy, but because it's taken me this long to open it! Eric stated in the original information about the puzzle that "I've given the prototype to several friends to play with and it seems to take most of them roughly an hour to solve." Well I can say it took me several months to solve it. The first few moves are fairly simple, and won't challenge anyone who's played with a traditional Japanese puzzle box. After that, things come to a complete halt, and no further progress can be made. Without giving too much away, there's something of a red herring in there, that threw me off for far too long. A non-puzzler would probably have opened the puzzle far faster. The final couple of moves are very well hidden, and the box gives absolutely nothing away as to how it will open. In all honesty, this isn't my favorite of the puzzles in the Havanas series, and the first is still the best puzzle in my view. I'm looking forward to the fourth box in the series now, and just hope that I manage to open it a little easier than I did with #3. So who am I? I'm a software developer professionally, but in my spare time I enjoy puzzling, and creating my own puzzles. I've always enjoyed building things, whether it be from Lego, wood, metal or whatever I could get my hands on. I've always claimed that I wasn't much good at it, but many of my friends seem to disagree, so I'm starting to listen to them and do something about it. The ramblings here are the result of that!